Standards Australia* has released a Roadmap for Blockchain Standards highlighting priorities for increasing trade and opening up new markets, by enabling the use of blockchain technologies. In April 2016, Standards Australia submitted a proposal for developing new international standards on blockchain technology and electronic distributed ledger technologies. The proposal was considered by the 161 member countries of International Organization for Standardization (ISO) and approved in September. The standards will be developed under ISO/TC 307. The Report is part of this wider initiative to develop international blockchain standards. The inaugural ISO blockchain standards meeting will be held in Sydney in April 2017, with representatives from 30 of the world’s leading economies attending. The Roadmap looks at the the various technical issues associated with developing, governing and utilising blockchains and Distributed Ledger Technologies. It identifies blockchain and DLT use-cases relevant to Australia; and prioritises the order of standards development activities. Standards Australia conducted a survey from 16 December 2016 to 10 February 2017, which informed the Roadmap. Over 100 responses were received from a balanced mixture of Australian government, industry, academic/research and consumer organisations. The report highlights that the development of international standards to support privacy, security, identity, smart contract, governance and other matters related to blockchain technology may contribute to further establishing market confidence in the use and application of the technology. 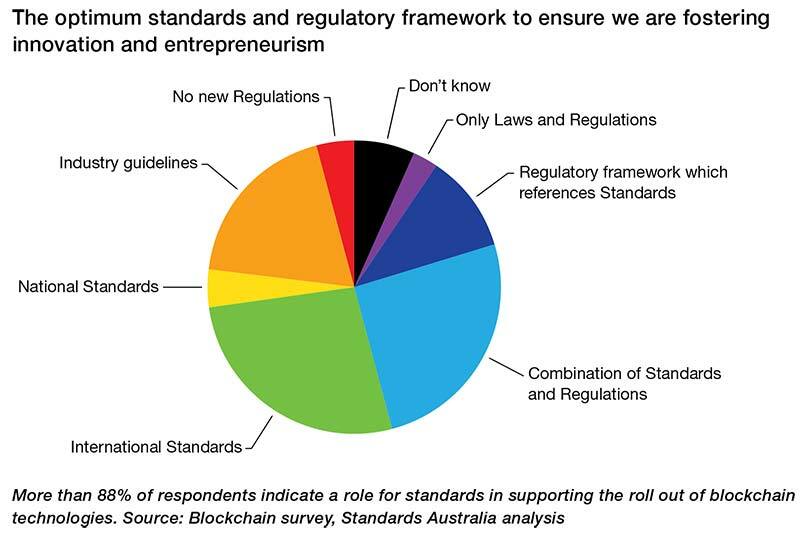 Over 88% of the survey respondents suggested that either national standards, international standards or a mixture of standards and regulation are required to support an appropriate co-regulatory framework for blockchain-related industries. Financial services and government services were identified by respondents as the two sectors with the greatest potential for use of blockchain technologies. Within the financial sector, Blockchain could support financial transactions, commodity exchange and remittances. However, enhanced privacy and security measures might be required before the application of Blockchain. The report noted that approximately 15% of respondents described the application of blockchain in supporting supply chain management as a priority for Australia. The report recommends that ISO/TC 307 should initially develop blockchain terminology standards to clarify definitions in the sector. Privacy, security and identity issues will be addressed through the development of one or a suite of standards. The next step would be to address governance and risk-related issues, with reference to existing ISO standards for risk management (ISO 31000) and IT governance (ISO/IEC 38500). Later, a reference architecture would be developed for Blockchain. According to the Roadmap, establishing interoperability amongst blockchain systems should be an overarching objective of ISO/TC 307. However, standards for interoperability are expected to be achieved at a later stage. Initial focus will be on applications in the financial services sector, the government services sector and supply chain management. Work on the supply chain standard could support the agricultural supply chain and other sectors, where the nature of the commodity unit changes through the course of the supply chain. The report recommends that ISO/TC 307 should work closely with ISO member National Standards Bodies to enable congruity of standards and the law. It would exclude law related matters in the development of standards for ‘smart contracts’, privacy, security and identity and limit its guidance to technical matters. However, the standards have to be robust enough so that they can be reference by regulators for policy and regulation. All images are sourced from the report from Standards Australia, referred to above. *Standards Australia is the country&apos;s peak non-government, not-for-profit Standards organisation.